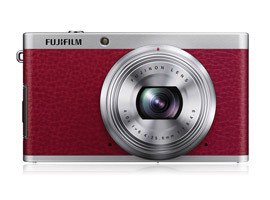 If looks could kill, the Fujifilm XF1 would be a successful assassin. It marries together a vintage design with modern touches, including a lightweight aluminum frame wrapped in luxurious looking imitation leather. The latter component comes in three colors: a classic black, a rustic looking brown, and a head turning shade of red. But this camera cloaked in faux leather is not meant for just faux-tographers – it packs some impressive specs to compliment its physical beauty. Peeling away the XF1’s exterior, a user will find the camera’s 12-megapixel 2/3-inch EXR-CMOS sensor. The sensor helps the XF1 achieve an ISO range spanning 100-12800. However, for higher ISO settings, the camera shrinks its pixel count to either 6 or 3 megapixels (depending on ISO). The latter is intended to provide users with maximum image quality in poor lighting. The camera’s sensor is complimented with its optics which includes 7 lens elements in 6 groups. The camera’s combined glass provides users with a 4X zoom lens that is equivalent to a focal length range of 25-100mm. Fujifilm advertises the XF1 as having aperture settings spanning the wide f-stop of f/1.8 to a more modest f/4.9. Users will need the widest aperture in low light, as the camera has no built-in flash. Interestingly, the lens is manual, and can be operated by simply twisting the zoom ring. Cool creative features are also crammed into the hardware of the XF1, including Fujifilm’s advanced filter options. The latter allows users to select 11 creative patterns like pop color, toy camera, and miniature effect. And all these artistic touches can be viewed using the XF1’s 3-inch 460k-dot LCD monitor (which happens to not be a touchscreen). • Sleek design and leather wrapped exterior. Comes in three colors. • Its 12-megapixel CMOS sensor. • Manually adjustable 25-100mm equivalent lens. • Aperture range of f/1.9-f/4.9 – the latter for telephoto lengths. • ISO range of 100-12000. • Creative filters and panorama mode. • JPEG and RAW file formats. • 3-inch LCD monitor with 460k-dot resolution. • Full HD video with stereo sound. • Its light and compact build means it can fit in most pairs of skinny (weight: 255 grams / 8.99 oz; measures: 108 x 62 x 33mm / 4.25 x 2.44 x 1.3 inches).